‘Designed at Talisman’ will see the New Kings Road showroom transform into a designer house as part of London Design Festival 2017. When Drummonds invited leading international interior designer, Maurizio Pellizzoni, to design a bathroom suite, he knew he had to create something at the epitome of luxury for this special event that runs from 15th September to 6th October. Maurizio selected a few of the new stunning pieces from Drummonds and combined these with timeless designs by Talisman London to create a room with wow factor. As with all of his interior design projects, Maurizio explored different ideas and inspirations, whilst bearing in mind the style of both brands range of designs. Often inspired by travel and international destinations, Maurizio’s vision for the bathroom suite was born out of viewing luxurious interiors that dress the beautiful properties of Bel Air. Elements of this style are synonymous with Maurizio’s designs where rich materials, wallpapers and unique pieces regularly frequent his interior projects where you’ll find no two designs the same. Maurizio embarked on this project by initially choosing the colour scheme with a monochrome floor, hand painted in a zigzag pattern. He saw it as important to be able to see the existing wooden floor and the beauty of the material’s natural imperfections. This would set the tone to create a luxurious feel, the same of which is associated with the mansions of Bel Air. The Drummonds statement freestanding bath is painted in shocking pink and is the centre of attention in the entire scheme. The brassware and metallic details have been selected in a polished chrome finish to add an extra layer of richness to the room. 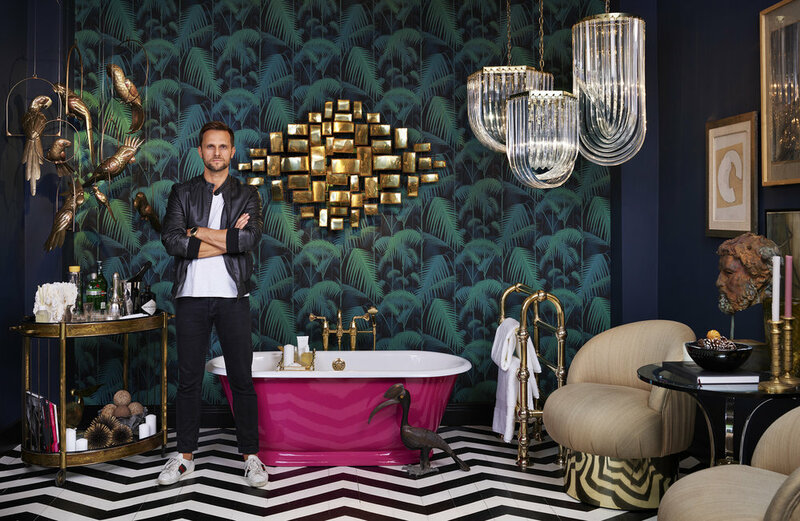 Maurizio chose a feature wall to frame the bath with a modern, textured wallpaper design covered with a detailed, multi layered palm leaf print by Cole & Son. The subtle lustre and vibrant green tones are perfectly juxtaposed with the bold pink bath. To complement the wall, one of the five colour ways in the print was chosen as the colour to paint the remaining walls with. From Talisman, Maurizio chose elegant furniture with personality and beautiful accessories with antique brass finishes to complement the entire scheme. A large 1970’s polished metal sculpture, brass swivel chairs and a Mastercraft cabinet, plus a collection of copper and brass parrots by Sergio Bustamante will bring a new dimension of styling to the Talisman pieces. Accessories from The White Company finish the scheme beautifully, along with an exotic Bird of Paradise plant from Architectural Plants.